Ian Garrone has farmers markets in his blood. He was nine when his family started Far West Fungi, and his grandparents sold citrus in markets long before that. “I learned to count at the farmers market,” he says. “I’d go with my grandparents and help load up the trucks. My first paid job was breaking down boxes,” Ian recalls. As a teenager, Ian (on the left in this photo) started helping his dad at the Civic Center farmers market, in the heart of San Francisco’s Tenderloin. “At 13 it gave me a real-world look at things.” Soon, he graduated to running his own market stand at the Palo Alto farmers market. Far West Fungi is one of 11 artisan food businesses that began in the Ferry Plaza Farmers Market and now have shops and kiosks inside the Ferry Building. And while the duplication can be confusing for shoppers sometimes (the building shops are called a “marketplace,” for instance), these spots also offer small local businesses an opportunity to develop a seven-day-a-week customer base, and to offer products it might not make sense to sell in the farmers market. 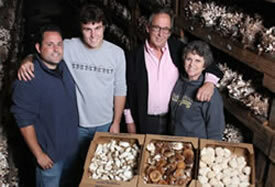 In the case of Far West Fungi, the latter is especially true, since the rules for certified farmers markets in California prohibit the sales of wild and foraged foods (farmers must grow what they sell, and must receive certification from their county for each product they offer at a farmers market). There were challenges, says Ian, in the transition from a farmers market setting to a retail store. “One of the hardest things for a while was realizing that when you close the gates you don’t have to break everything down and take it all home with you,” he says with a chuckle. And while there are more and more efforts underway to farm “wild” mushrooms in the works (farmed truffles are now available, for example), Ian has a special place in his heart for the unique relationship that wild fungi have with the natural world. “Most of the edible wild varieties are mycorrhizals,” he says, meaning that they have a mutualistic relationship with tree roots. “That makes them almost impossible to reproduce in a warehouse or farm,” he says. Ian is also a social guy, and he says one of the most fulfilling parts of his job is the opportunity to build long-term relationships with customers and chefs in the area. This sociability extends to his parents, with whom he seems to genuinely enjoy working. Ian’s three brothers have also been involved in the Far West business at various points (one still sells at a farmers market), but, he says, none have opted to work quite as closely with John and Toby as he has.